A top U.S. general is visiting Egypt at a time when the government is under fire for its response to an evidently orchestrated terrorist campaign of killings targeting minority Christians in northern Sinai. 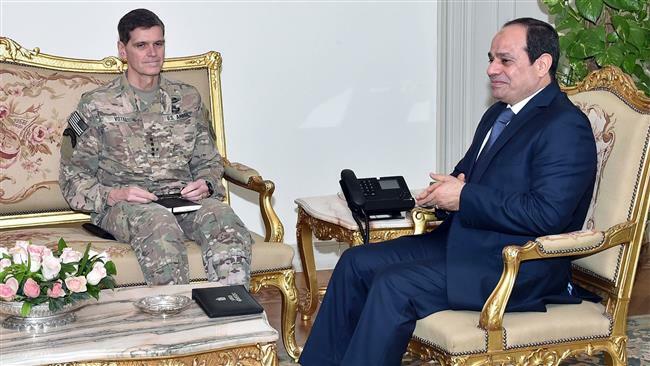 U.S. Central Command commander Gen. Joseph Votel on Sunday described Egypt as “one of our most important partners in the region” and said his talks with President Abdel Fattah el-Sisi and others would explore ways to strengthen the partnership in the fight against terrorism and in promoting stability. Underlining the nature of the threat, hundreds of Coptic families have fled the town of El-Arish on Sinai’s Mediterranean coast in recent days, to escape a campaign of violence attributed to the Sinai affiliate of the Islamic State of Iraq and Syria (ISIS/ISIL) terrorist group. At least seven Christians in El-Arish, the largest town in the sparsely-populated desert peninsula, have been killed since the end of January, among them a teacher, a veterinarian and a shopkeeper. Five were shot and two burned to death. Last week the ISIS affiliate released an online video threatening to cleanse Egypt of Christians, whom it described as “infidels” and accused of insulting Islam. Copts comprise about 15 percent of the population of Egypt, the most populous Arab nation. The video, entitled “And fight against the disbelievers” (a verse from the Qur’an), featured a clip of a terrorist said to have carried out a deadly suicide bombing last December at the Copts’ most important church, the St. Mark’s Cathedral in Cairo. More than 100 panicked Christian families fled from Al-Arish to Ismailia, a town some 125 miles to the west, where churches are providing aid. After several days and considerable criticism, the government agreed to provide youth hostel accommodation in Ismailia for them. A number of human rights and political groups have accused the government of not doing enough to protect the Christians despite the ISIS video threat. They are urging authorities to help those who want to leave temporarily, and to safeguard their properties in their absence. The Egyptian military has been confronting ISIS militants in northern Sinai for several years, at the cost of the lives of hundreds of soldiers. The group is held responsible for the Oct. 2015 down of a Russian passenger plane after it took off from a southern Sinai resort. All 224 passengers and crew were killed in what President Vladimir Putin confirmed was a bomb attack. But harassment and violence against Copts, accompanied by a weak government response, goes back decades, long before the establishment of the ISIS affiliate in late 2014. The worst previous spate, apart from the Cairo church bombing, was a series of church attacks by angry Islamists after Sisi in mid-2013 ousted the one year-old Muslim Brotherhood administration of President Mohammed Morsi. Criticism also came from Coptic communities abroad. “Swift and decisive action must be taken by the Egyptian Government to protect the Coptic Christian community in North Sinai, before any more innocent lives are lost at the hands of extremist militants,” the Australian Coptic Movement Association said Saturday. For the past six consecutive years, the U.S. Commission on International Religious Freedom, an independent statutory watchdog, has urged the federal government to designate Egypt as a “country of particular concern” under U.S. law for its treatment of Christians. The State Department overruled the recommendation each time. The U.S.-based organization Coptic Solidarity says it’s hoping President Trump sets a new course with Egypt – supporting its fight against terrorism but also making human rights a high priority. “Coptic Solidarity calls on the new administration to give a high priority to ensuring justice for Copts with Egyptian officials, to end the culture of impunity, and recommends that a percentage of U.S. economic aid to Egypt be dedicated to compensate Coptic victims of violence for lost lives or properties,” it said earlier this month. And it urged the president’s support for legislative initiatives to designate the Muslim Brotherhood a foreign terrorist organization.